Don't write things down to remember them later, write them down to remember them now. The paper company that has emerged out of the Draplin Design Company of Portland and the Coudal Partners of Chicago, Field Notes, is pushing back against the vanishing trend of the memo book in the best way possible, with unparalleled versatility and luxurious quality. With 48 pages of thick paper that boasts no bleed through, this little notebook is small enough to fit in your back pocket for convenience and accessibility. Also, the handpicked cherry wood covers provide a sleek design and a durable guard for your thoughts within. They produce many types of meticulously crafted memo books that can be used for any thoughts, from a handwritten ledger to something as simple as a grocery list. What pulls all of their products together is their acute attention to detail. No one else could make this type of notebook as perfectly as Field Notes. The flawless design and lucrative versatility pushes them straight to the top of paper products in quality. 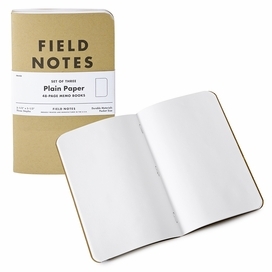 Field Notes memo books are simply for writing down things that are worth remembering.